Duck Hunter Xtreme by INTERACTIVE TOY CONCEPTS LTD.
Imaginext Bigfoot the Monster by FISHER-PRICE INC.
Speedster Race Car by WORX TOYS INC. 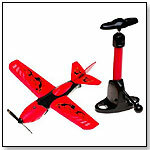 This little flyer is equipped with micro air-engine technology and comes with a mini pump. It’s sized for smaller hands, making it ideal as a backyard flyer for a junior pilot. This large, hairy spider comes with a remote control to direct its movement. For a realistic effect, each leg moves separately. It requires two AAA batteries. — Fred Rosenberg, owner of On the Park in Kingwood, Texas, said in fall 2009 that these R/C Tarantulas are popular at his store. Elite Fleet™ Vertigo Helicopter - Sky Shark by KID GALAXY INC.
At 6” long, this tiny helicopter features a V-Wing design and can fly up to four or five minutes on a 20-minute charge. 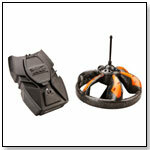 It has dual rotors and can be steered right or left while hovering. The charger/infrared controller requires six AA batteries (not included). — Kazoo & Co. in Denver sells two dozen per month of Kid Galaxy’s helicopter, Owner Diana Nelson told TDmonthly in fall 2009. 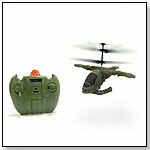 — Two of 40 specialty retailers pinpointed Kid Galaxy’s helicopter as a hot-selling R/C item. Interactive R/C™ Demolition Derby Cars by KID GALAXY INC. 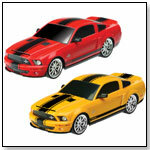 Doors and hoods dislodge and trunks open when these remote-controlled vehicles are smashed and crashed together. The unhinged parts can simply be pressed back into place. The cars require 2 AAA batteries and the remotes take 3 AAA batteries (not included). — “We sell dozens and dozens of Kid Galaxy’s R/Cs,” Owner Joe Berardoni Sr. of Pun’s Toys in Bryn Mawr, Pa., told TDmonthly in fall 2009. — Patti Tepper-Rasmussen, owner of Learning Tree Toys, Books & Games in Oklahoma City, told TDmonthly in fall 2009 that her store sells about four Demolition Derby items per month. Morphibians™ Explorer by KID GALAXY INC. This four-wheel drive, remote-controlled vehicle can be navigated over land and on water. It has working headlights. 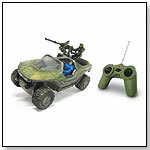 The vehicle takes three AA batteries and the controller takes two AAA batteries (not included). 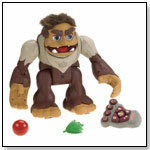 — J. Christopher Toys in Jonesboro, Ark., sold 68 Morphibians since August, Owner Mary Horne told TDmonthly in October 2009. 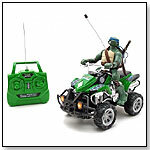 Full-Function R/C TMNT ATV Rider (Leonardo) by NKOK INC.
TMNT R/C Skateboarder (Raphael) by NKOK INC.
Halo 3 R/C Hornet by NKOK INC.
Halo 3 R/C Mongoose by NKOK INC.
Halo 3 R/C Warthog by NKOK INC.
Morphibians Rover by KID GALAXY INC.
With sleek lines and aggressive styling, the Morphibians Rover is ready to take on any terrain — pond or bath, carpet or lawn — with its heavy duty tire tread and amphibious vehicle technology. 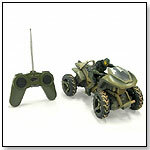 The vehicle takes three AA batteries, the controller takes two AAA batteries, and the Rover runs at a 27MHz frequency. Other Morphibians are available at 49MHz in order to accommodate two vehicles being driven at the same time. 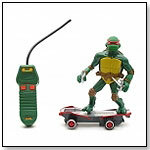 — “Our best-selling gift for boys is probably the Morphibians from Kid Galaxy, especially if a dad is shopping,” said Janet Gregory, owner of Over the Rainbow Toy Store in Anchorage, Alaska, in June 2009. — “Kid Galaxy's Morphibians have sold well for almost two years straight,” Joe Berardoni, owner of Pun's Toy Shop in Bryn Mawr, Pa., told TDmonthly in summer 2009. Ultimass Radio-Controlled D-Fly III Tiger Helicopter by EMIRIMAGE CORP.
Star Wars R2-D2 Radio Control by HASBRO INC.